Celebrate the arrival of spring and check out the Bay Area’s most scenic Wildflowers and Waterfalls Hike!! Professional guides. Beautiful trails. A fun group to hike with. Set on the northern flank of Mount Diablo, this 7.5 mile loop will lead us to almost half a dozen waterfalls in Donner Canyon. And of course, if our timing is right, all of the cascades will be framed by a plethora of native California wildflowers: Poppy, Lupine, Indian Paintbrush, Milk Maids, Ceanothus, Mountain Voilet, Brewers Rock Cress and Mosquito Bills, just to name a few. We’ll start our 7.5 mile hike from the Mitchell Canyon Staging Area. The first 2 miles along Bruce Lee and Oak Roads are fairly mild and flat as we walk through rolling hills and oak woodlands eventually linking up with George Cardinet Back Creek. Once we cross the creek, however, we’ll climb 600 vertical feet up a series of difficult switchbacks. With the climb behind us, we’ll be rewarded with commanding views of Clayton Valley and Suisun Bay. As we make our way along the Falls Trail loop, we’ll encounter one gorgeous display of waterworks after another, witnessing a total of 4 distinct waterfalls along just this section of trail. 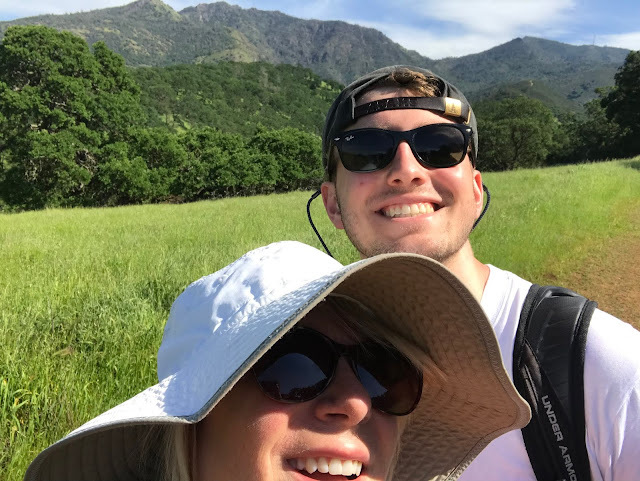 While I finished up a long week working to get 1,300 people settled into a new building, Sharon and Jack did a Good Friday hike from the Mitchell Canyon Visitor Center. They were trying to do a waterfalls and wild flowers hike that Sharon had read about. 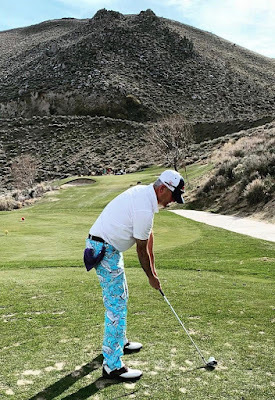 Larkin and I stopped here with Gainsley et al on day two of the 2019 Petersen Shootout. This marker is located at 2282 Main Street, Genoa, Nevada. The GPS coordinates for this location are N 39° 00.196 W 119° 50.782. In 1851, George Chorpenning and fellow Pennsylvania entrepreneur Absalom Woodward received a contract for $14,000 from the U.S. Post Office to establish the first U.S. mail service between Sacramento, CA and Salt Lake City, UT. The monthly trip was to be made in a record time of 16 days. 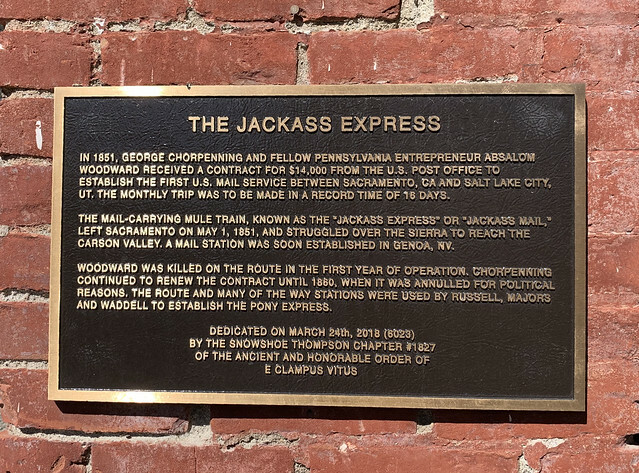 The mail-carrying mule train, known as the "Jackass Express" or "Jackass Mail," left Sacramento on May 1, 1851, and struggled over the Sierra to reach the Carson Vally. 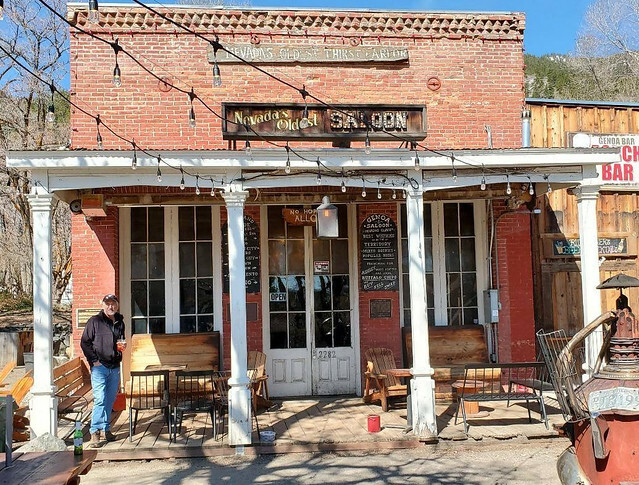 A mail station was soon established in Genoa, NV. Woodward was killed on the route in the first year of operations. Chorpenning continued to renew the contract until 1860, when it was annulled for political reasons. The route and many of the way stations were used by Russell, Majors and Waddel to establish the Pony Express. Jack is home for few days over his Easter break! He caught a 5:45 pm United flight nonstop from Dulles to Sacramento. 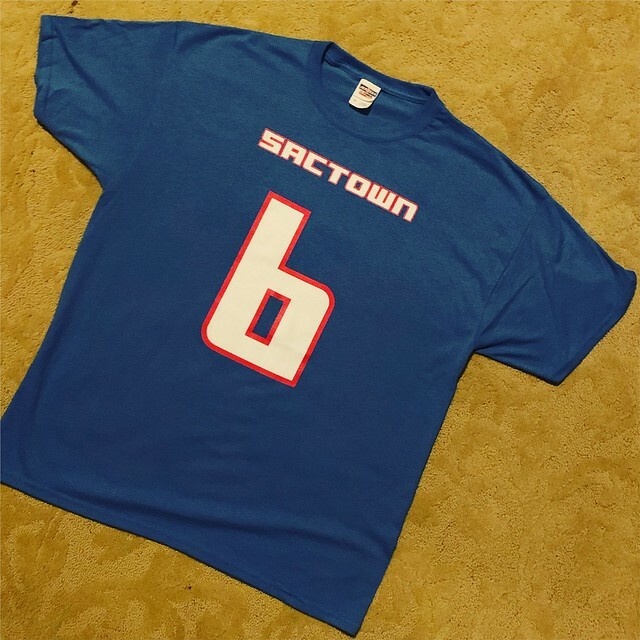 The flight landed in Sacramento about 8:20 pm. Sharon and I got to the terminal just before he came down the escalator. It is great to have him home. Starting over the weekend, we are working to move 1,300 employees to a new corporate headquarters in the next week! Up early, Larkin and I used our vouchers to have breakfast downstairs. Afterwards, I packed up the room and loaded the car. Looking at both Waze and Google Maps during the breakfast, the fastest way back to Roseville was Highway 88 to Highway 50 to Douglas to East Roseville Parkway. Leaving the parking lot about 8 am, I was in Roseville by 10:35 am. There was a rock fall on Highway 50 on the grade out of South Shore that stopped traffic for a few minutes. I spent the rest of the day working at our new building getting ready for the first group of employees to move in on Monday. It is going to be an interesting week. I enjoyed the weekend. I always enjoy Larkin's company. I am getting to know more of the regulars. Gainsley and his posse plus Borja and his brother-in-law are great additions! Up fairly early, Larkin and I had breakfast at Katie's Country Kitchen in the hotel. The package for the weekend included a $5.00 food voucher for use at the hotel. Like last year, we met Gainsley and his gang at the Genoa Bar. This is billed as Nevada' oldest thirst parlor. The plan for the day was to play the Silver Oak Golf Course. We played this course in 2010 and in the rain in 2016. Rod started with a pitching contest. This was followed by a shotgun start at 1:00 pm. The format for the day was a shamble. Rod and I played with Rod's nephew Danny and his friend Logan. Danny was crushing the ball. On one of the par fives, he hit the ball 365 yards with the wind behind him! As the result of Danny's drives, I ended up with a liberally scored winter rules 80!?! I have never scored that low in a shamble. Larkin had a 78, Logan had a 79 and Danny had a 68. 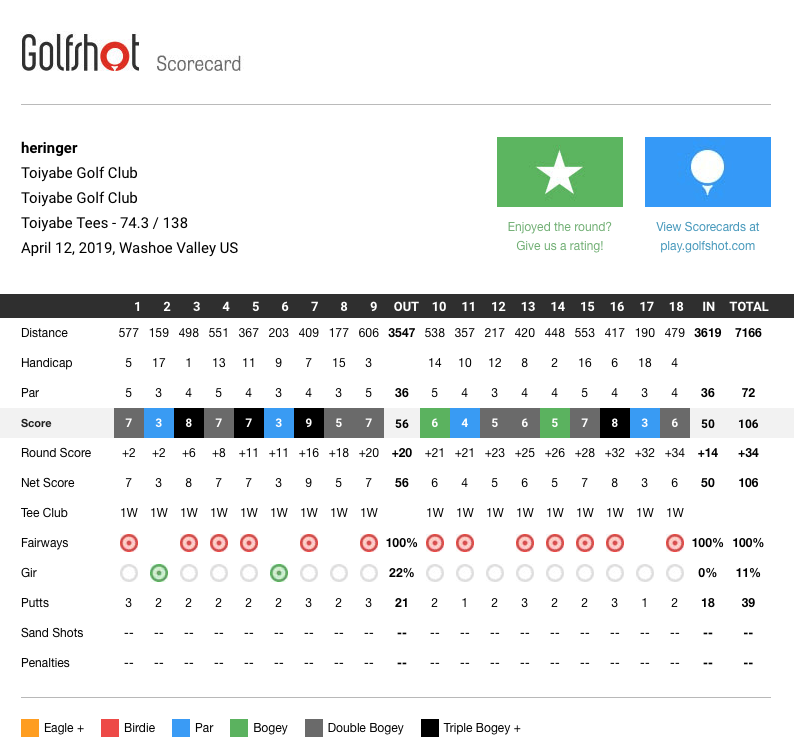 I had fond memories of the back nine, but it includes a nasty uphill par 5 and a difficult uphill par 4. We only used one of my drives. On the par three 16th, I hit on to the cart path above the green to the right and the ball trickled down to within 12 feet of the pin. After golf, we headed back to the hotel and got cleaned up. The golf weekend included dinner on Saturday. There was a hosted bar from 7:30 pm to 8:30 pm with a buffet dinner at 8:15 pm. Our table at dinner included Gainsley, Rick, Art, Colin, Larkin and I. After dinner, Rod's brother Scott emceed. They require all of the first time attendees to get up and tell a joke. I was surprised how many new newbies there were. After dinner, we wandered back to Rod's suite. At some point, we wandered downstairs and walked through the casino. Larkin and I crashed early. For the eighth time in ten years, Larkin and I played in the Petersen Shootout [2010, 2011, 2012, 2014, 2016, 2017 and 2018]. We missed 2013 when Rod kept moving the date around and it finally landed on a weekend when Sharon, Jack and I were in Hawaii. In 2015, Larkin wasn't available. I signed up with Borja as my wingman, but when he canceled at the last minute, I bailed. I left the house about 8:30 am. 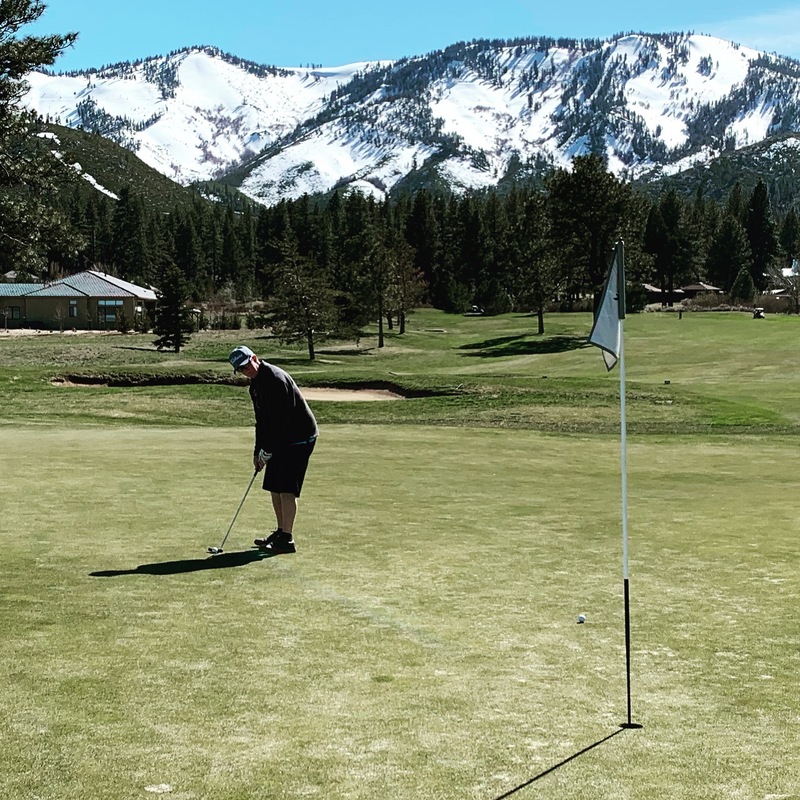 Taking Highway 80 to 395, I got to the Toiyabe golf course about 11:10 am. I have never played this course before. Like last year, the group was big. There were just under 60 people. The group included Gainsley, Rick, Art and Colin. Rod started the day with a long putt contest. I won! I made the second round. I was fourth closet to the pin in the second round, but the first three missed before I sunk my four foot second putt to win. The group teed off in a shotgun start at 12:30 pm. Larkin and I played with Ben Borja, his brother-in-law Scott and the husband of Ben's wife Lynn's best Friend (Mike). We didn't go to the driving range. Partly as a result, I started horribly. Starting with a shotgun start on the 7th hole, I just couldn't strike the ball over the course of the first two holes. I eventually settled down and posted a 50 on the back nine. Overall, I had a liberally scored winter rules 106. The scorecard is here. 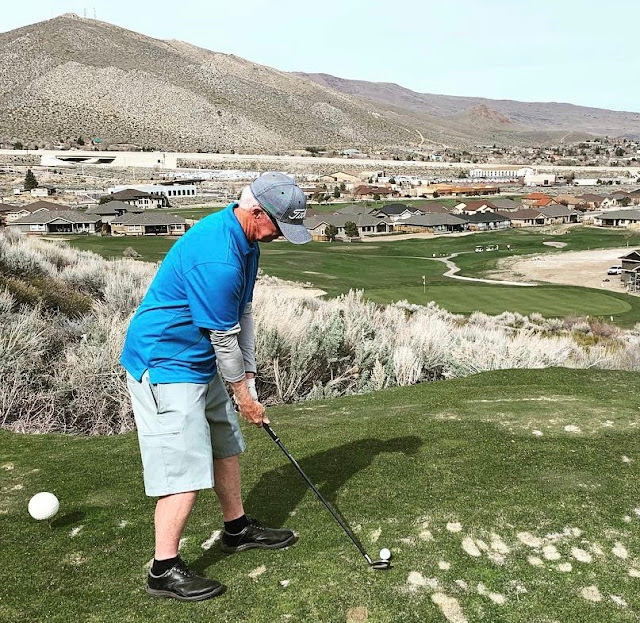 For the third year in a row, the group is staying at the Carson Valley Inn in Minden. I stayed at this hotel in a suite once in late 1991 with she-who-will-not-be-named. Larkin and I spent some time in Rod's suite before we headed to dinner. Looking for someplace different to eat, we walked to Khristoper's Ristorante. It ended up being a very interesting evening. Before we ordered, the owner [Fred J. Simon, Jr] started talking to us. He ended up sitting at our table for the rest of the evening. Both Larkin and I had the lobster ravioli. We made a stop at Rod's suite after dinner. Larkin and I ended up crashing about 11:45 pm. After signing our taxes, Sharon and I finished a short week with dinner at Piatti. We split a Farm Lettuces Salad [shaved fennel, radish, pine nuts, shaved grant, sherry vinaigrette]. For mains, Sharon had a Grilled New York steak with fries, while I had Pappardelle [5 hour pork & beef bolognese, spinach, olive oil]. This colloquium will be a historical inquiry into the following questions: Has Europe been Americanized? Have Europeans in the course of the 20th century been Coca-colonized or McDonaldized? Have Americans and Europeans grown increasingly alike with respect to adopting mass culture, consumer society, and market economies? If so why? What is the explanation for the seemingly irresistible power of Americanization? When did this process begin and what has America's role been in this process? Or, conversely, is Americanization an illusion? Has there been appropriation and resistance so that national identities and diversity have been sustained and even intensified? Has it provoked a search for identity in national or ethnic difference? Above all what does this transformation mean? The emphasis of the course is the logistics or Supply Chain function in firms that source, produce, distribute and market in multiple nations. The management of the logistics in such firms differs from its domestic counterpart along several key dimensions. First, there is the need to be able to identify and analyze factors that differ across nations, which influence the effectiveness of this function. These include worker productivity, process adaptability, governmental concerns, transportation availability, and culture and so on. In addition, because of the distances involved, transportation and distribution are of greater significance. Finally, these geographically dispersed set of facilities and markets must be integrated and manage to enhance the strategy of the business unit. Therefore, some of the sessions of the course will focus on cross-national decisions and others will focus on managing across nations. Throughout the course we will emphasize the role that emerging technologies are playing within the supply chain and e-commerce. For the purposes of the course, the perspective will be that of the director of logistics or Supply Chain, vice-president of logistics or other, senior level general managers with primary responsibility for the production and distribution of manufactured products. A major theme throughout the course is that sourcing, manufacturing and distribution are of primary importance in the formulation of business and corporate strategy. We want to look at the strategic decisions within logistics as they impact the ability of the firm to achieve its selected overall strategies. Sacramento-based Sutter Health reported Thursday that it had posted a year-end financial loss of $198 million for 2018, a precipitous decline from 2017 when the nonprofit hospital giant generated income of $893 million. This is the first time Sutter has reported a loss since its merger with San Francisco’s California Healthcare System in 1995. Sutter’s operating revenue and expenses remained relatively stable, company leaders said, but the company did not enjoy the same lift from its stock market investments in 2018 as it did the prior year. Income from investments and unrealized stock gains was $651 million in 2017, but the market plunged in 2018. Sutter’s portfolio logged a loss of $267 million. Also in 2017, Sutter received a payment of $432 million from the state of California to help defray the losses it incurs from serving Medi-Cal patients. In 2018, the Sutter payout was $272 million. The loss comes as Sutter faces two high-profile lawsuits – one by the U.S. Justice Department over Medicare charges and another by the California Justice Department over antitrust issues. The company said it would share how much it has spent on legal fees on its Form 990 filing with the Internal Revenue Service in the fall. Sutter’s operating revenue grew by $253 million to nearly $12.7 billion. Its operating expenses increased by $378 million, and its income from operations dropped by 38 percent to $201 million in 2018. The company made capital investments of $924 million in 2018, the same amount it spent the year before. Last year’s major capital expenditures went toward ensuring that California Pacific Medical Center meets 2030 seismic regulations, and that work is now complete in San Francisco. The California Pacific Medical Center’s Van Ness Campus opened on March 2 of this year, and the CPMC Mission Bernal Campus, at Valencia and Cesar Chavez, opened Aug. 25, 2018. Sutter paid particular attention to the environmental impact of the Mission Bernal hospital, which has 120 licensed beds. Roughly 50,000 gallons of rainwater can be captured there for irrigation and to dissipate heat from the HVAC system on the building’s rooftop cooling towers. It also has a pedestrian plaza with permeable landscape that will drain some 360,000 gallons of storm water annually away from the storm and sewer system. The $2.1 billion Van Ness Campus has 274 licensed beds and five living-roof gardens. The 1 million-square-foot building also incorporates water-saving features and direct natural sunlight that lowers energy costs. It is the first structure in North America to incorporate viscous wall dampers that are designed to absorb strong tremors during an earthquake. The technology, used extensively around Japan, helps to reduce overall stress on buildings. Last year, company officials noted, Sutter Health put roughly $734 million toward addressing the needs of communities it serves. That’s an increase from $612 million in 2017. The figures include traditional charity care, the unreimbursed costs of providing care to Medi-Cal patients, investments in health education and public benefit programs such as community clinics and prenatal care for those with low income. 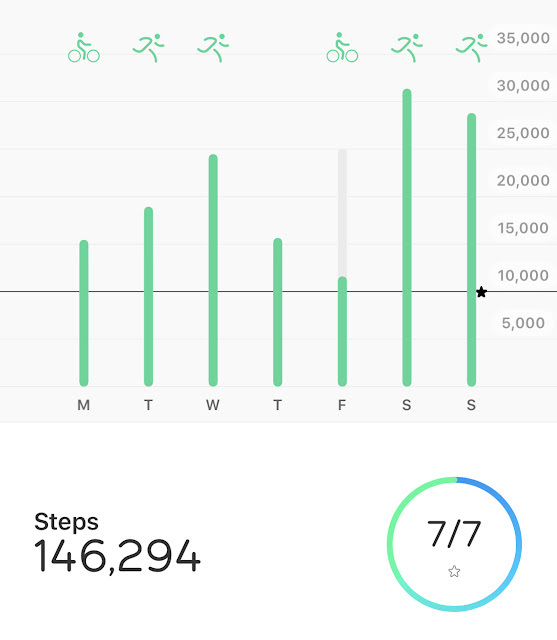 After a horrible start in March, I started to get back on track last week. I got 146,255 steps last week. I ran 25.5 miles and cycled 22.6 on the Peloton bike. Larkin and I went to the Sacramento Kings versus New Orleans Pelicans NBA game. This was the last home game of the 2018-2019 season. We had dinner at the Burger Lounge before the game. Leading by 10 points in the first half, the Kings fell behind by 15 points in the third quarter. They rallied to tie the game in the fourth quarter, but lost by the final score of 133 to 129. Ian Clark was the high scorer for the Pelicans. He had 31 points on 11 fro 21 from the field, 7 for 15 from three and 2 for 3 from the free throw line. This was Clark's career high. In his five year NBA career, he has started eight games!?! The high scorer for the Kings was Harold Barnes. He had 29 points on 10 for 18 from the field, 4 for 7 from three and 5 for 6 from the free throw line. At half-time, Larkin and I wandered down at talked to Hunter and Yuli. In one of those bizarre twists of fate, Loren is getting married in Tahoe City the same weekend as Drew's wedding in West Port. 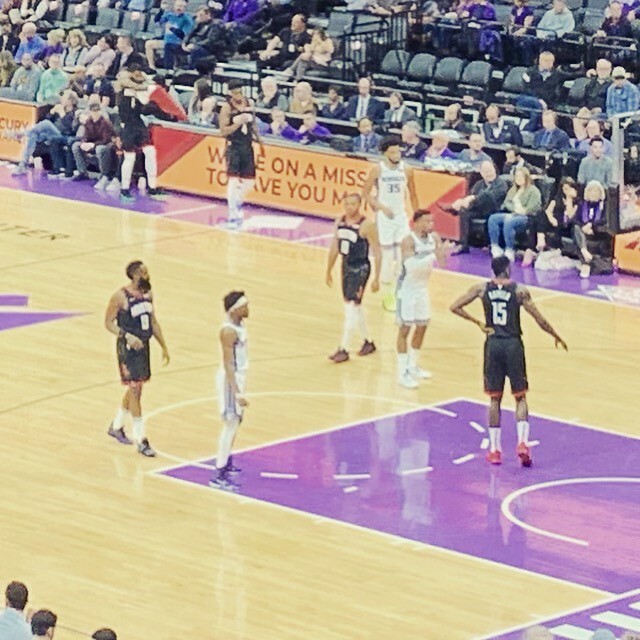 The Kings now have 7 wins and 4 losses in games that I have seen in person during the 2018-2019 season. This is the most games I have seen in a season since 2009-2010 when I was sharing season tickets with the Laskins et al. Saturday night, Sharon and I watched Second Act on the AppleTV. While we were looking at new releases last weekend, Sharon had watched the trailer and wanted to see the movie. Second Act is a 2018 American romantic comedy film directed by Peter Segal. It stars Jennifer Lopez, Leah Remini and Treat Williams. The film was released in the United States on December 21, 2018. I am frankly not sure how to rate this movie. It slightly exceed my very low expectations. The best that I can say was that it wasn't horrible. Nevertheless, with so many other things available to watch, I don't recommend it. Sharon and I finished the week with dinner at Mikuni on Hazel. I can't remember the last time that just Sharon and I went to dinner there. This is usually somewhere we go with Jack! The next two weeks are shaping up to be wild. The Petersen Shootout is Friday and Saturday next week. At work, we are scheduled to start on next Sunday moving 1,300 people into a brand new building. Drew left Milo Greene in late 2015. In the last three years, he has focused on song writing, producing at his own Mirror Wall Studio and recording some of his own music. He released some music as The Guest and the Host. The song for 2017 is Remedy by the The Guest and the Host. You can find the work in progress Soundtrack for My Life here! [Note to self], going back into 2014, Drew worked with a couple of guys in Nashville on an album of music that has never really seen the light of day. Calling themselves The Proper Gentlemen, I really enjoyed the initial rough cut of the album. One cut from the album is here. I need to incorporate at least one of the songs in my soundtrack at some point! 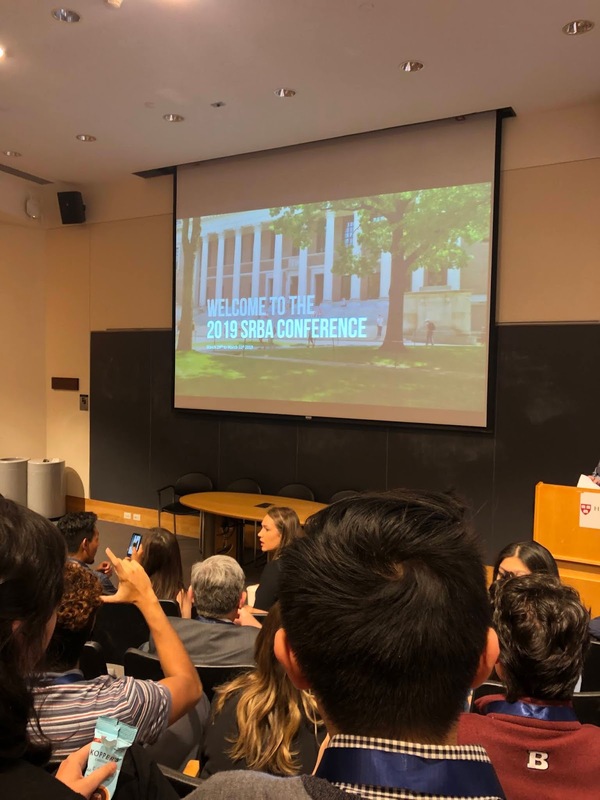 In his role as the COO of The Corp, Jack spent the weekend in Boston on the Harvard Campus at the 2019 SRBA Annual Conference. Our SRBA Annual Conference unites student-run business organizations (and aspiring educational organizations) from across the country to work, learn, and grow together. The Annual Conference is more than a place to hear amazing ideas from amazing students, leaders, and support organizations. It’s an opportunity to make connections that make businesses succeed now and relationships that last a lifetime. The conference programming is purposefully designed for both members of established student run businesses and individuals looking to just get started! Whether you have millions of dollars in revenue and want to perfect your marketing strategies, or are just beginning to get your feet wet with university relations, this conference is the place for you. We welcome students, advisers, board members, alumni, and university officials. Larkin and I went to the Sacramento Kings versus Houston Rockets NBA game [Section 118, Row T, Seats 1 and 2]. I got two tickets for Sharon in section 117; she invited Jeana. Behind by 10 points at the end of the first quarter and 16 points at half-time, the Kings never really got back in the game. The Kings lost by the score of 130 to 105. James Harden was the high scorer for the Rockets. I enjoyed having a chance to watch him shoot threes and drive to the basket. Harden had 36 points on 12 for 19 from the field, 7 for 12 from three and 5 for 6 from the free throw line. He added 10 assists. Buddy Hield was the high scorer for the Kings. He had 20 points on 8 for 16 from the field and 4 for 9 from three. Hield didn't get to the free throw line!?! I rarely feel this way, but the refereeing seemed particularly one sided in the first half. Fox was called for a foul on a Harden three point attempt where the replay clearly showed that he didn't touch Harden. At half-time, we wandered up and talked to Snipes. With the Kings trailing by more than 20 points, Larkin and I spent most of the fourth quarter visiting with Sharon and Jeana in the south end of the Arena. The Kings now have 7 wins and 3 losses in games that I have seen in person during the 2018-2019 season. My book for March was The Passage of Power by Robert Caro. Drew gave me this book for Christmas in 2017. It is volume four of a planned five volume biography of Lyndon Johnson. I decided to buy the first book and start at the beginning. I finished the first volume [The Path to Power] in March of 2018, the second volume [Means of Ascent] in May of 2018 and the third volume [Master of the Senate] in December of 2018. This book fits into my long term project to read books about all of the presidents. The Passage of Power was selected as one of Time magazine's Best Books of the Year (non-fiction #2) and was a finalist for the National Book Award for Nonfiction (2012). Additionally, the book won a number of awards, including: the National Book Critics Circle Award (2012; Biography); the Los Angeles Times Book Prize (2012; Biography); the Mark Lynton History Prize (2013); the American History Book Prize (2013); and, the Biographers International Organization's Plutarch Award (2013). In this fourth volume, Caro covers Johnson's life from 1958 to 1964. The book is really broken into four parts. First, Johnson's sleuth attempt to win the 1960 Democratic Presidential nomination at convention. He didn't want to campaign openly and compete in the primaries. Second, Johnson's selection as John F. Kennedy's Vice President and his subsequent three years as the Vice President. Johnson was never really a key part of the Kennedy administration. Third, the events surrounding JFK's assassination in Dallas in November of 1963 are followed from Johnson's perspective. I found this section of the book particularly powerful. My notes about where I was when I heard Kennedy was shot are here. I am not a conspiracy theorist. Nevertheless, the assassination of South Vietnamese Premier Ngo Dinh Diem, numerous attempts by the CIA to kill Castro and Robert Kennedy's pursuit of the mafia make me wonder who was really behind JFK's assassination. Finally, the book covers the Johnson's assumption of the presidency and his significant accomplishments in the months after Kennedy’s assassination. Johnson was able to push through a tax cut bill and the 1964 Civil Rights Acts in his first six months. Like the other books, Caro paints a broad picture. In particular, in this book, there is a lot of background on Robert Kennedy and Harry Byrd. Robert Kennedy and Lyndon Johnson had a long history of mutual dislike. The book also paints a picture of Robert Kennedy as a very angry and combative individual. [Note to self], I need to find a Robert Kennedy biography. I enjoyed all four of Caro's books. It has been a project. I have read more than 2,100 pages about Lyndon Johnson in the last fifteen months. I am looking forward to the next book. I saw a note saying that it is likely to be a couple of a years before the next book is completed.